I've had a galley of this book on my shelf for almost a year - I believe I picked it up at BEA 2009. * It had sort of fallen to the bottom of my pile, but after reading Bermudaonion's review of it last week, I decided to finally give it a go. I wasn't wowed, but I also wasn't disappointed. 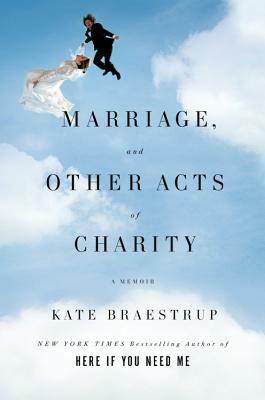 Marriage and Other Acts of Charity is the second memoir from pastor and writer Kate Braestrup. Her first memoir, Here If You Need Me, was apparently a New York Times bestseller when released. This new memoir tackles the often tricky and sticky issue of marriage. As a pastor, a widow and a wife, Braestrup has seen marriage from the inside and the out, performing weddings, serving as a marriage counselor and struggling within her own marriage(s), and this is a collection of her valuable insights into the subject, from the first kiss until death does thee part. The back of the book (well, the galley, at least) claims that this book is "Part memoir, part observation of modern marriage, and part meditation on the roles of God and love in our everyday lives... a unique and unforgettable look into why, and how, people love each other." Unlike much of the copy we find on the backs of books, this one hits the nail on the head. What Braestrup has composed is a collection of her own stories, paired with philosophical and theological musings on love, relationships and the role that God - or Jesus, in some instances - plays in each of these. Despite being written by a pastor and dealing frequently with the subjects of God, Jesus and Christianity, Marriage and Other Acts of Charity successfully keeps itself from ever becoming preachy. On the contrary, in fact: Braestrup's approach to religion is so rational and logical that hers is an Organized Religion (capitalization hers) that I could almost begin to understand. Unfortunately, because the memoir tackles so many aspects of the author's personal history as well as personal reasoning, it can be a bit uneven; some transitions were so jarring as to require a second read, although this is perhaps something that has since been edited for the final version. There is a lot packed into this 200-page memoir, but the sheer volume forces the anecdotes and musings to be a bit staccato at times. That being said, the overall tone and message of Braestrup's work makes it worth the relatively short read (I read it in less than a day). Her stark honesty about her own failings as a wife, mother and pastor are comfortably settled in with the raw emotions surrounding her first husband's death, the raising of her children and the new love she finds later in life; her story is one that any reader can relate to on some level, no matter what his or her current relationship looks like. Bottom line: Not the most moving or gripping of memoirs available, but one with enough insight, humor and poignancy to make it worth the read. Any pastor that can write with such honesty about her own beliefs, struggles, successes and failures should be praised, and if reading about Braestrup's mission to "love more" can convince just one person to be just a little bit kinder, than I believe she would think her mission complete. *Disclosure: Thank you to the publisher, Little, Brown, for the galley copy provided at last year's Book Expo. I want to read this one too after her review! Have you joined the Reagan Arthur Book Challenge yet? You should -- it's perpetual and no stress! I think I enjoyed this book so much because it moved me and made me think about love and how lucky I am. I'm glad it didn't disappoint you. You really should join The Reagan Arthur Book Challenge! Thanks both! I've just signed up - post will be going up tomorrow. I hadn't realized that so many of the books I'm already on the lookout for are Reagan Arthur titles!